Get well soon messages when someone is sick, injured, or recovering from a surgery, your words of care and love can go a long way in making them feel better and relaxed. It doesn’t matter whether the person is a friend, colleague or a relative. What matters is how your caring words make them feel! Doctor’s medicine is important, but sometimes, it’s more important for patients to feel good about themselves! The healing power is often said to be a matter of how you feel. So when you send a get-well-soon card to a close friend or loved one, make sure the messages inspire and encourage them to feel better! Falling ill is a great way to get paid off. I wish you enjoy your beauty sleep while funding our poor doctors! Wish you a quick recovery! Dear friend, we are sad that you have been away for a while. We have been missing your smile. We miss you at work! Get well soon! If you had not enjoyed all that ice cream without me, the fever would not have been this severe. Next time call me to share all the ice cream! Get well soon! What happened to you? You need to get well soon. We have to continue our gossiping, so sleep well and get well soon. Now that you have fallen sick, you must know that you are the most likable person around. Even the bacteria and viruses have fallen for your charms. Wish you make a speedy recovery! Now that you are under house arrest, you will get all the lawful punishments you deserve! It’s time to get all the bed rest and fluids that you deserve so much! Wishing you to get well soon! I wish you to make a speedy recovery. You know I need to borrow some money! Don’t you know that you are the only bank I take loans from! So get well dear! Another chance to sleep in for you? Some folks will go to great lengths to get some extra shut-eye. All kidding aside, get well soon! If you were not this beautiful, the virus would not have hit on you. I am luckier than you because I am not as charming as you. Get well soon! I used to think that you were superhuman. But now I think that you too are human like us! Get well soon! A healthier you means less work for me. What are you waiting for? Get well soon! Folks who think laughter is the best medicine apparently have never had morphine. Be well. Feel better in a hurry so we can get back to making fun of you with no guilt. I’ve waved my magic wand to make it all better…what’s taking so long? Sorry you had to eat hospital food. Life is boring without you. Hurry up already! I can only be nice for so long – get better soon. God’s speed in your recovery to full health! Prayers coming your way for a speedy recovery. Sending recovery good thoughts your way. Hope your feeling well soon. Sending good, healthy vibes your way for a speedy recovery. Being sick is no fun — come join the fun people and get well soon. Feeling better sometimes just takes a little time. You’ve taken enough. Get well right away. I’m Florence Nightingale and you’re my patient. We will get through this together. I worry that when you get all our warm regards your fever will increase further. Just kidding! Get well and get back soon! You don’t look great when you are ill. So get well in a hurry so that you look attractive again! Wishing you a speedy recovery! I think God is always testing your tolerance because you have lots of patience. Be on good terms with god and get well soon! I am looking for a magician to fix that broken leg of yours. You don’t have to spend so many weeks in recovery! Just kidding! Wish you a speedy recovery! I remember telling you that I will stand by you forever! But that didn’t mean that you had to break your hands for me to prove my words! Get well soon! Make sure that you don’t play with the medicines and follow what the doctors tell you! Wish you a complete and speedy recovery! If you don’t get better fast I will inject you with lots of pain killers. I guess you know that I am not great when it comes to taking injections! Get well and skip my injections! Hope day by day goes quickly and you’re up on your feet soon. Your illness is another confirmation for my doubts that you are such a great attention seeker! Wish you a quick recovery so that you can seek all the attention when you are healthy! I know that there is no fun in being in the hospital. I wish that you are kicked out of there quickly! Get well soon! Check out our messages for occasions like birthdays, weddings and more. Inspiring a patient and making them feel strong can contribute to their recovery in a big way. Here are some messages that can inspire your friend or loved one to get will and get back to their normal life! I wish you to get well and get back to life again so that you can experience all the delights and fun that life has to offer! When I checked the doctor’s prescription I found that it didn’t have a very important medicine – your best friend’s company! Wish you a speedy recovery! I wish that every day your strength grows and you become happier and healthier! Fill yourself with all the positive energy and you will recover faster! Don’t worry about the illness. I am taking karate classes to kick the hell out of it! Wishing you a speedy recovery! Take a look outside and the sun is shining bright and tells you to get better and get going! Cheer up and get well soon! This is the best time when you should know that so many people care about you. And I am one of those people! Wish you get well and back to work soon! There is time for work and time for rest. You feel sick because it was time your body got some rest. I think it was for the best! When you get back on your feet, it will be time for us to party hard! Wishing you a speedy recovery! We all miss you, your kindness and your sense of humor! You need to know that everyone is eagerly waiting for your return. Get well soon! I have a whole bunch of new stories to tell! Get well and get back soon so that I won’t forget them! When I was sick, you cracked up a joke and said that laughter is the best medicine! It made me even more ill. Don’t worry I will not be sending many jokes to you! Wishing you a speedy recovery! Good humor and health are like sunshine to greenery! Life is not just about living, it’s about living well! So shine and get well soon! I am wondering why it’s easy to read the doctor’s bill and not their prescription! Keep pondering as you heal quickly! Surgeries are followed by some pain and challenges. A few words of care and love during this time can help speed up the healing! You are one of the strongest and bravest people I know! Now it’s time to heal and get better soon! Wishing a speedy recovery! I wish you the best in health and that you make a quick recovery from your surgery! A successful surgery is 100% of the job done well! Now it’s up to you to heal quickly and get back to life! Wishing you a quick recovery! The best thing about a surgery is that everyone takes full care of you! It is an even better feeling than getting a vacation! I wish you a speedy recovery! Your surgery was your doctor’s headache! Healing and recovering is yours! Rest and relax and enjoy all the pampering and care you get! Wishing you all the care and love so that you make a quick recovery! Don’t worry if you feel crummy after the surgery. Its only for a few days. Sending you wishes for a faster recovery! I wanted you to know that you are in our thoughts and good wishes! I am praying for your quick recovery and better health! Feel messages of healing coming your way from all your friends at the office. When I think of your strength, I know that a surgery is nothing to stop you! Wish you a speedy recovery! The medicines and pain are not as bad as the hospital food! I know how much you must be craving for home-made food! Get well soon so that you can enjoy all the good food you love! Sending you our love and wishes after your surgery! We wish you to recover quickly and get back to being healthy and happier than ever! It’s time for you to listen to your doctor and loved ones! Drink all the fluids, take all the medicines and take rest. You can work and enjoy all you can once you have recovered fully! Wishing you a speedy recovery! I am happy for your successful surgery! Spending your days in the hospital can be boring. But the best part is getting your food in bed! 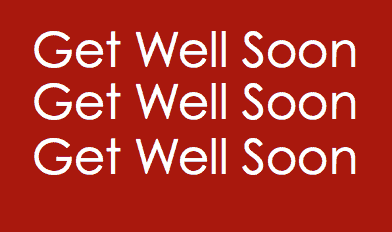 Wishing you a speedy recovery so that you don’t get spoilt by the daily routine! I wish you comfort and rest after your surgery! I want you to know that we are thinking of you and wish you a speedy recovery! 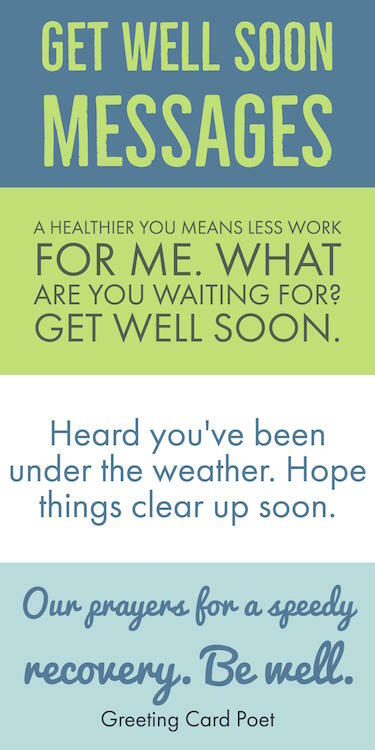 Looking for get well card messages that hit the mark? Review these listings for ideas. And, then, personalize your card with your own message. Card messages aren’t my thing. Get well soon! During this down time we hope that your recovery is a relaxing and restful one. All the best and we hope you get well soon! GET WELL SOON!! Missing you lots and we hope that you have a quick recovery. Better you than me. Get well soon! GET WELL SOON!! We’re missing you lots at [ home / work / school ]. Wishing you a speedy recovery and looking forward to having you back soon. Good health starts with a happy heart. Hope these flowers start the job! Here’s to hoping you get well soon. We’re thinking of you during this time and we hope that your recovery is a restful one. Get well soon greetings from one of your best friends. Here’s to hoping you GET WELL SOON! We’re missing you at [ home / work / school ] and can’t wait to have you back. We’re hoping your surgery (GOES/WENT) well, and that your recovery is quick! Hope you’re back on your feet pronto. You’ll be on your feet again soon. Hoping these flowers brighten not only your room, but your heart today. We pray and hope this finds you well on the way to recovery. If I told you to “Get Well Soon,” it wouldn’t be soon enough. Get Well Now. Loving relief for your aches and pains. Loving thoughts are tucked inside this bundle of flowers! May every day find you feeling better! May you feel your usual self again in no time!! Missing you lots while you’re getting back on you feet and hope to see you at [ home / work / school ] again soon. May your hospital stay be only short! Wishing you a complete and restful recovery. GET WELL SOON! May your recovery be a quick and zippy one. Enjoy the time off and we hope to see back on your feet again soon. May your recovery be a short but restful one. We’re all thinking of you during this time and we hope you’re back on your feet soon. Our warmest thoughts are with you. Wishing you a speedy recovery. Our prayers, healing thoughts, and a little sunshine to brighten your day are coming your way. Sending you some get well cheer! Take care of yourself and feel better soon. We miss you! Come back soon! We’re sick without you. Get well soon. We’re all missing you terribly and can’t wait to have you back at [ home / work / school ] again. Get well soon! Lots of love. We’re all thinking of you during this time while you’re getting better in hospital. Wishing you a speedy recovery and we hope to see you again at [ work / home / school ] soon. We’re all thinking of you while you’re in hospital with your feet up. Wishing you a speedy recovery and we hope to see you at [ home / work / school ] again soon. We’re thinking of you during this time!! Wishing you a restful recovery and we hope that your back to you’re usual self again soon. Our prayers for a speedy recovery. Wishing you a super duper, fast and zippy recovery! [ Home / Work / School ] hasn’t been the same without you. Wishing you all the best with your recovery. May you use this restful time to recharge and energize. All the best. You are in my thoughts. If there is anything I can do, please let me know. You are missed! Get well and hurry back. For a quick recovery and return to good health. Sending you a boatload of well wishes for a speedy recovery. Hugs and Kisses and get well wishes. Hope your tail is wagging again soon. Take care of yourself and be well soon. Praying you are feeling great in no time. Heard that you’ve been under the weather. Hope things clear up soon. Sending loving thoughts your way and hoping for a quick recovery. Caring thoughts are with you. Surgery stinks! Get well in a hurry – we miss you.